Oklahoma weather is fickle and one never knows how long these gorgeous Spring days will last. Before we know it we may be sweltering in 90+ degree heat. But for now, the days are lovely and the evenings are utter perfection. Last night we took advantage the perfect temperatures and hosted our Sunday Family Dinner outdoors. In addition to my kids, niece and her boyfriend, we also invited my parents and one of Chris’ longtime friends, Jennifer, to join us for dinner. I made layered salad (I’ll put the recipe below), my mom brought her delicious potato salad, David grilled hot dogs and we had chips and dip and pitchers of iced tea. We set up tables on the patio and enjoyed a wonderful meal together. 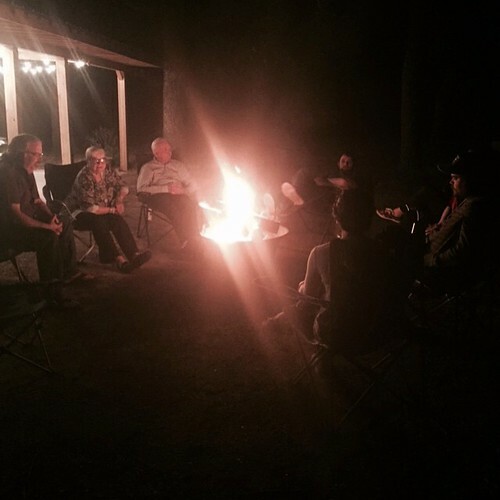 When it got dark, David lit a fire in our fire pit and we all sat around it chatting, telling stories, and laughing. Oh, so much laughter! Chris had also made a special playlist so we had a soundtrack for the evening, as well. Last year we allowed ourselves to get too busy for leisurely evenings around a fire or stargazing. We are not going to make that mistake again. We have already eaten outdoors and sat around the fire several nights this Spring and I intend to do it as often as possible while the weather is so nice. Life is too short not to make time for these special moments. Mix mayonnaise, sugar and desired seasoning (I use Creole seasoning). Carefully spread over vegetables, making sure everything is covered all the way to the edges of the dish. Sprinkle grated cheese evenly over the mayonnaise then sprinkle with crumbled bacon. Refrigerate for at least a couple of hours before serving. *You can also include a cup or two of frozen peas in with the vegetables. It truly was. So glad you were with us to enjoy it.